Midrange Chromebooks have never been so good. Here's a long-term, real-world comparison of this season's standout models. Chromebooks provide a dead-simple way to get online and get stuff done -- but the process of picking out a Chromebook has gotten increasingly complicated over the years. One look through Google's Chromebook device page tells you all you need to know: There are tons of different models out there -- and at a glance, most of them look pretty similar. Heck, I keep an eye on these things as part of my job (and spend time using most of them, too! ), and even I have trouble keeping track of the differences. Two of this fall's new Chromebooks, however, definitely stand out from the pack. One is Toshiba's 2015 Chromebook 2, an updated version of the device that's been my go-to Chromebook recommendation for the past year. 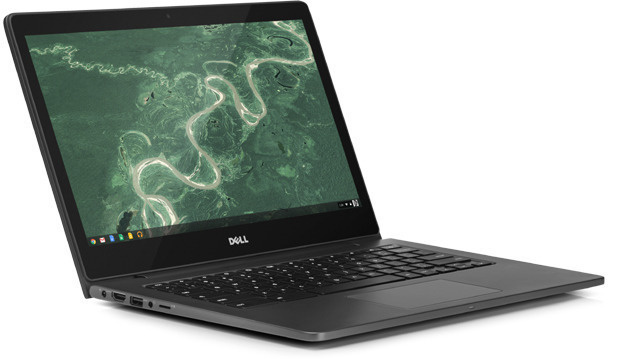 The other is Dell's Chromebook 13, a new laptop that brings a touch of luxury to the midrange Chromebook realm. So between the $330 and the $429 Chromebooks, what does that extra hundred bucks get you -- and is it worth your while? After spending the past several weeks using both the Toshiba Chromebook 2 and the Dell Chromebook 13, the answer is quite clear. Toshiba's new Chromebook 2 looks and feels almost identical to its predecessor, with a plastic body and a textured plastic lid. The build quality is slightly better than most systems in its price range, but it's nothing to write home about. The same can be said for the device's design, which is okay but unexceptional. Dell's Chromebook 13 is a different story. The laptop has a carbon-fiber cover and an aluminum-magnesium body that work together to make the system stylish and approachable, as well as exceptionally sturdy. It's by no means at the level of build quality or design of a high-end system like Google's $1,000 Chromebook Pixel, but it's a really nice laptop -- and a meaningful step above every other system in the sub-$500 class. Dell's laptop is the larger of the two devices, at 12.9 x 9.0 x 0.72 in. compared to the Toshiba's 12.6 x 8.4 x 0.76 in. frame. It's also heavier, at 3.23 lbs. vs. Toshiba's 2.97 lbs. In real-world terms, those differences are pretty subtle: The Dell device does feel a bit bulkier -- as you'd expect, given its materials -- but neither system is especially svelte. While these devices may not win any awards for thinness, they fall into a good middle-ground size when it comes to most typical use. They're big enough to give you ample room to work, which isn't always the case with the more common 11-in. Chromebook models -- but at the same time, they're small enough to remain easily portable and fit effortlessly into a bag, which is something you sacrifice once you start getting into larger desktop-replacement-style devices. Both Chromebooks are also comfortable to use on your lap or on a table. In either position, everything about the Dell's construction feels noticeably more premium than the Toshiba's -- from the strength and stability of its large hinge, which opens with ease and keeps the screen completely still during use, to the base area around its keyboard, which has a surprisingly soft texture that feels smooth and pleasant under your hands. 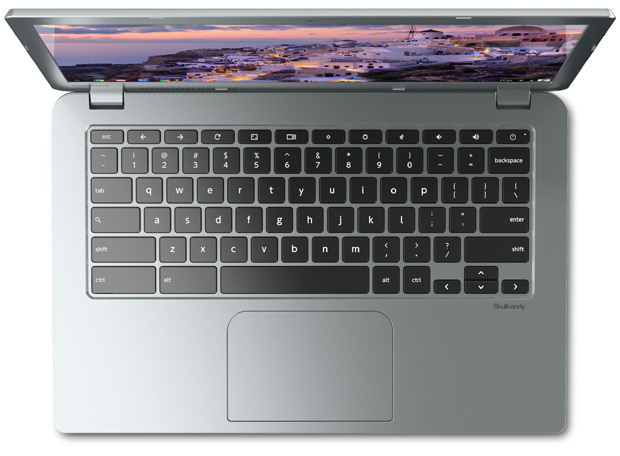 The Toshiba Chromebook is certainly fine in those regards -- just more "okay for the cost" as opposed to "spectacular." Its screen can get a little shaky as a result of its two-piece hinge, and the plastic surface of its base is serviceable but nothing special. Once you get past the surface, things start to look much more similar between the Dell and Toshiba Chromebooks. Both laptops have excellent 13.3-in. 1080p IPS displays, for instance -- a distinction that goes a long way in setting them apart from most affordable Chrome OS systems. The screens are crisp, clear and richly colored. Once your eyes get used to their level of quality, you won't be able to tolerate the dull and grainy TN-based displays on the majority of inexpensive laptops. The displays on the Dell and Toshiba Chromebooks are really quite comparable, with one noteworthy exception: The Dell's screen has a matte finish, while the Toshiba's display is glossy and reflective. I wouldn't call either approach inherently better; image quality and viewing angles on the two are similarly superb, and there's little to complain about with either panel. It's mainly just a matter of personal preference (if you even have a strong leaning either way; most people probably won't give it an ounce of thought). Both systems have a fair amount of plastic bezel surrounding their displays, with an HD Webcam in the center of the top portion. The devices' keyboards are in the same general league, too: plasticky but satisfying to type on and backlit for optimal evening use. The backlighting on the Dell looks a bit better, but either setup will get the job done (and you can actually adjust the lighting level on either device by holding the Alt key and pressing the brightness up or down key in the function row). The Toshiba keyboard has slightly larger keys with a softer-feeling finish, but like the quality of the backlighting, it really isn't a make-or-break factor. Far more significant is the difference in the devices' trackpads. The Dell Chromebook's is made of glass and feels just incredible under your fingers. You may never have considered a trackpad to be a highlight of a laptop, but after using this Chromebook, you will. The Toshiba device's is ordinary in comparison -- made of plastic and about on par with what you see on most lower-end Chromebooks. It's accurate and easy to use but in a very different class from Dell's. Both laptops have impressive speakers that are loud and fairly full-sounding (as laptop speakers go). I'd give the edge in audio quality to the Toshiba: Its speakers are artfully hidden beneath its keyboard, which allows sound to be directed toward you without the need for any ugly visible grilles. The Dell Chromebook has speakers on either side of its bottom, which isn't nearly as ideal of a placement -- but they're on the outer edges of the surface, at least, and so they usually avoid getting muffled entirely. Still, while the laptop's audio is reasonably decent in and of itself, it ends up sounding markedly less loud and clear than the Toshiba Chromebook's when you listen to the one right after the other. Dell and Toshiba both offer varying levels of processing power with their new Chromebooks. I'll make that part of the decision easy for you: The only models you really need to consider are the base-level models I mentioned at the start of this review -- the $429 Dell Chromebook 13, which has an Intel Celeron 3205U processor and 4GB of RAM, and the $330 Toshiba Chromebook 2, which has an Intel Celeron 3215U processor and 4GB of RAM. Those almost-identical setups are more than capable of handling even the most demanding needs -- like my own anything-but-average style of working, which tends to include frequent switching between as many as 15 to 20 simultaneously open tabs. I've used both systems from morning to night in that manner and things have been consistently smooth and snappy, without a single slowdown or sign of lag on either device. Both laptops are fairly quiet during use, too, and neither gets especially hot. For the vast majority of people, upgrading to a model with a more powerful chip or additional RAM isn't going to make enough of a noticeable difference to be worth the extra cost. If you want to spend more money -- especially in the range of $600 to $900, as Dell's higher-level configurations climb -- you'd be better off bumping up to the high-end Pixel and gaining the top-of-the-line hardware, design and display it provides (all of which will be far more meaningful than the added processing power alone in day-to-day use). In the configurations I'm reviewing, both laptops have 16GB of internal storage space along with a slot for external storage (regular, mini or micro SD on the Toshiba and -- somewhat strangely -- micro SD-only on the Dell). They both also include 100GB of Google Drive cloud storage for two years, which would cost about $48 if you paid for it outright. We've got one more significant point of differentiation to cover and that's stamina: The Toshiba Chromebook 2 does admirably well, with a quoted 8.5 hours of battery life per charge and real-world results generally ranging between 6.5 to 7 hours for me. The Dell Chromebook 13, meanwhile, is outstanding: It's listed for a whopping 12 hours of use per charge, and I've been clocking in somewhere between 10 and 12 hours total on most days. Remember, too, that my usage tends to be unusually resource-intensive and heavy on multitasking, so if you're more prone to keeping just one or two tabs open at a time -- the way most people use a Chromebook -- you'll probably be able to stretch things out even longer. Even with demanding use, though, both systems provide respectable battery life, with the Dell taking the clear lead in terms of true all-day computing. I should also mention that each laptop uses its own proprietary charger, which may be a bummer to anyone hoping to move toward the up-and-coming universal USB Type-C standard. Thus far, the 2015 Pixel is the only Chromebook to feature such a connection. Last but not least, the Dell and Toshiba Chromebooks share the same set of ports and connectors: one USB 2.0 port, one USB 3.0 port, a dedicated HDMI-out port, a headphone jack and a security lock slot. If you're looking for the best all-around Chromebook you can buy short of $1,000 right now, Dell's Chromebook 13 is, without a doubt, it. The laptop redefines what a midrange Chromebook can be, with a combination of solid performance, a high-quality display and elevated build quality. If you have $429 to spend, it's the one you want to get. Toshiba's Chromebook 2 offers the same level of performance and the same caliber of display in a less premium package. You're getting a device that's just as capable -- only not as nice to use (and with less outstanding, though still generally quite sufficient, stamina). By accepting that tradeoff, you're keeping an extra $100 in your wallet. All considered, I'd say this: The Toshiba Chromebook is certainly good enough for most casual computing purposes, and if cost is a concern, I wouldn't hesitate to get it. If you can justify the extra $100, though, the Dell Chromebook will give you a meaningfully better overall experience. Things like premium materials and a top-of-the-line trackpad make a laptop significantly more pleasant to use -- and given the choice, that's undoubtedly what you want. With their potent mixes of performance, portability, quality and value, these two devices are the most advisable Chromebook purchases for most people right now. The only real question is how much you're looking to spend.